InEight® Control provides the detailed data necessary for you to take immediate corrective action to stay on time and on budget. It brings together critical budget, as-built and what-if forecasting tools related to costs, man-hours and productivity. It gives you complete control over every aspect of project performance. 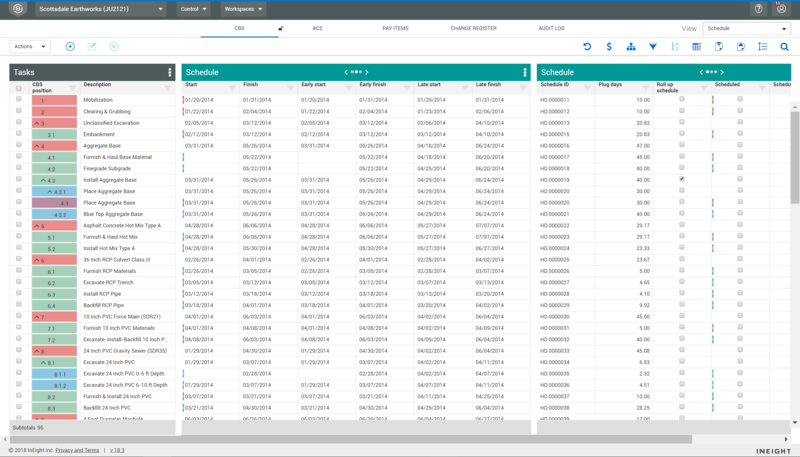 InEight Control integrates with scheduling software and ERP systems, as well as other InEight solutions, to eliminate redundant data entry and provide transparency into project costs and productivity. When a job is awarded, we need to turn our estimate into a control budget that we can track against as quickly as possible. Keeping our stakeholders informed of budget and forecast changes – including all the what’s and why’s – is critical to ensuring confidence in successful project completion. My number one responsibility is to make sure our team’s forecast for the job is accurate. To do that, we need speed and flexibility in how we update the numbers. At the end of every job, we should have new and updated benchmarks for cost and productivity that our estimators can use on the next job. We need to monitor construction performance with the immediate calculation of earned values and other performance factors, long before the bills come in from our contractors. We need visibility to the most recent progress, costs and productivity in the field to drive timely billing and update our forecasts. Everyone wants to know the cost and completion status of the project. We need an easy way to produce and share reports that drive confidence, without resorting to manually assembled Excel spreadsheets. We need an easy way to keep track of trends and changes to show the impact they have on the budget and forecast. Calculate earned values with InEight Control’s integrated system that provides both cost and schedule analysis. We help you track planned, earned and actual values and gain a deeper understanding of the timeliness of construction activities with SPI and schedule variances. 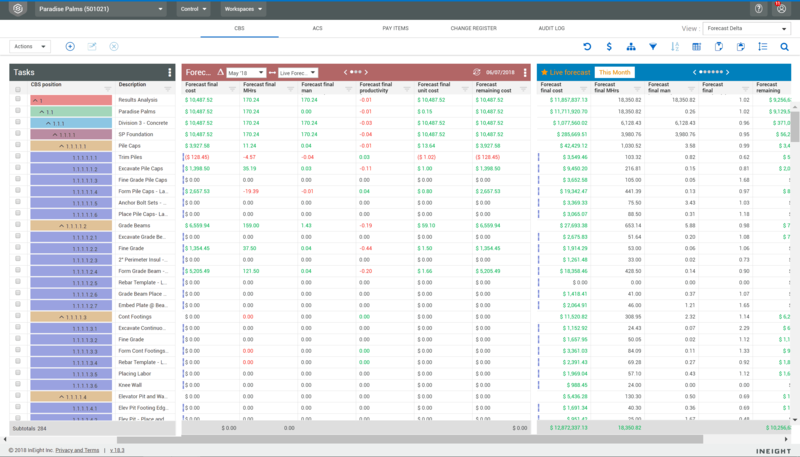 Evaluate multiple what-if forecasts to determine the most accurate option and use our multiple forecast methods to deliver valid month-end projections. You can also have users submit forecasts for review, so supervisors can approve values before they affect the project’s bottom line. Compare forecasts across time periods to identify any outliers that require immediate attention. 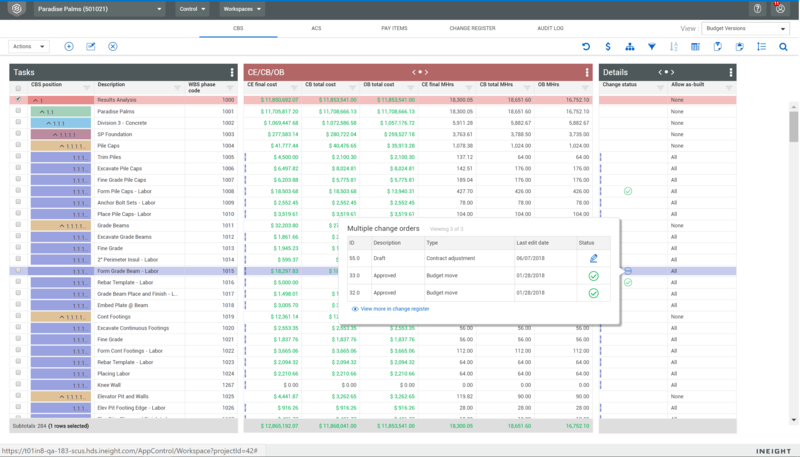 You can rapidly resolve any issues with InEight Control’s audit log, which captures every forecast adjustment such as who made the change, the value before and after, and more. 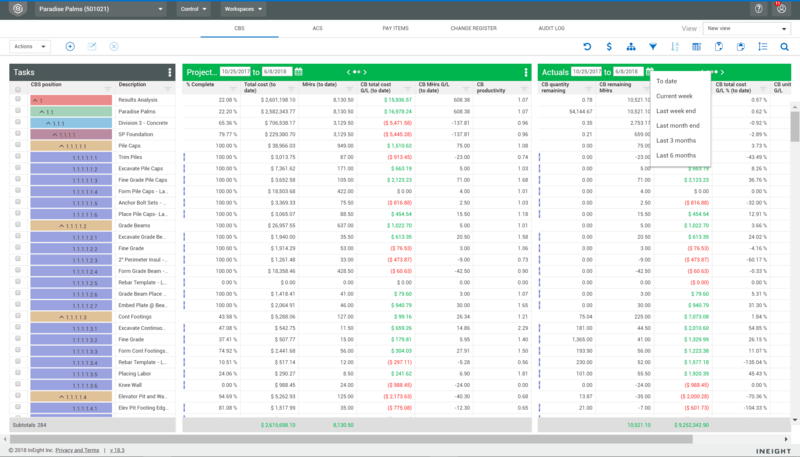 InEight Control helps you handle budget versions, moves and contract changes as they occur and the project progresses. You can manage the original budget, control budget and current estimate at any level of the project, including WBS, line item, cost categories and more. 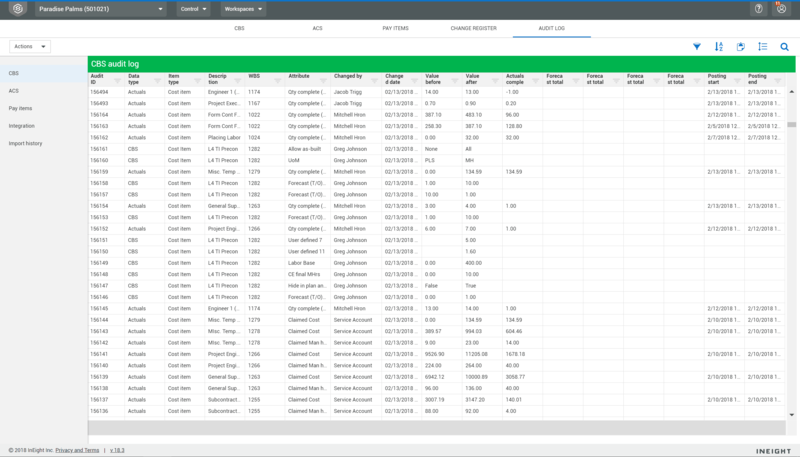 InEight Control keeps an audit trail of changes to show cost and schedule impacts since the budget was established. 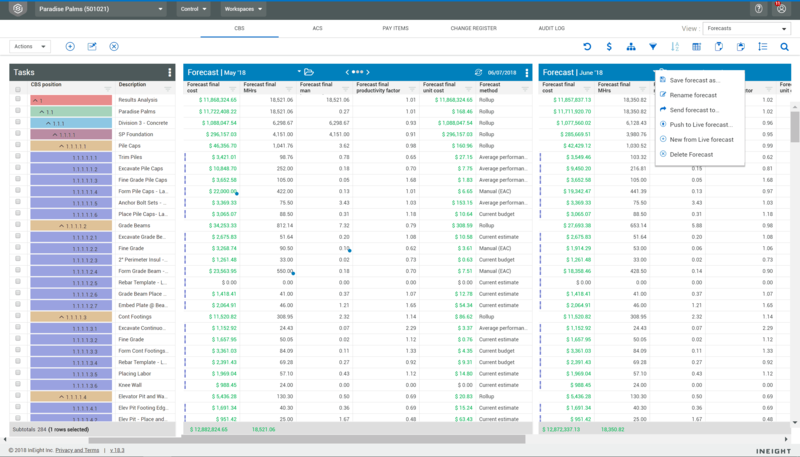 Detailed audit logs allow you to monitor cost trends and potential budget changes to provide visibility into the changes that occurred, and who created and approved them. 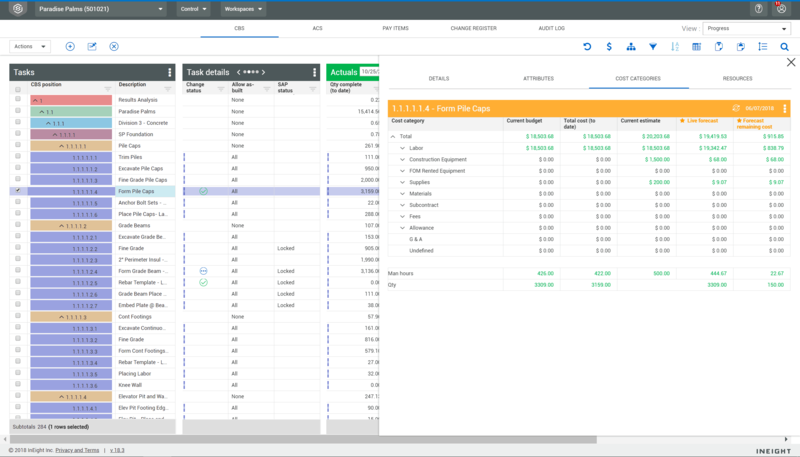 InEight Control compares actual expenditures to estimated and budgeted values to allow you identify cost overruns or savings. You can synchronize budgets, forecasts and actuals by financial period with ERP systems, so month-end values align with corporate standards. Improve forecasting. InEight Control tracks or imports project progress to calculate earned values and other plan versus actual metrics by WBS, line items and cost code. These capabilities are enhanced with integrations to ERP systems, Excel and InEight Plan to pull in critical information. Find out how Kiewit Power Constructors used InEight’s project cost management solutions to improve collaboration, simplify tasks, and track and share cost-modeling and benchmarking. Now, I can pull and query data for the entire company in real-time and see what productions they’re seeing, what past costs they’ve experienced, which is amazing. Having better access to data has definitely increased visibility, accuracy and productivity. InEight provides an enterprise platform that standardizes our estimation and controls processes. Overall, the ability to access data and spending the time to analyze the data and validating exceptions has really improved our overall processes and eliminated some of the time spent manually doing things. That’s something we can see every day, it’s a pretty cool tool. in on time and on budget.